2a) Buy a new ECM connector pin (I bought the Cummins Pigtail part number #3164263 for ~$10.00+tax at a local Kenworth dealer) or use an old junk yard harness to salvage a single pin with a ~6"-7" lead. 2b) If you bought the pigtail #3164263, the lead will be too short, so pick up some 18AWG to extend the lead length. The pigtail already comes with a crimp connector and a heat shrink insulator ready for the extension-lead. - Crimp the ~5" 18AWG extension-lead into the pigtail and hit the heat-shrink sleeve with a heat-gun (or a lighter!!) Please check your own extension-lead lengths before crimping - this ~5" is from my lousy memory !! - Add a 1/4" ring terminal to the end of the extension lead (this'll connect to a ground post) - I bought the ones with a semi-clear blue "plastic" sleeve, the sleeve is actually a weather-proof heat shrink. Hit the heat-shrink sleeve with some heat. 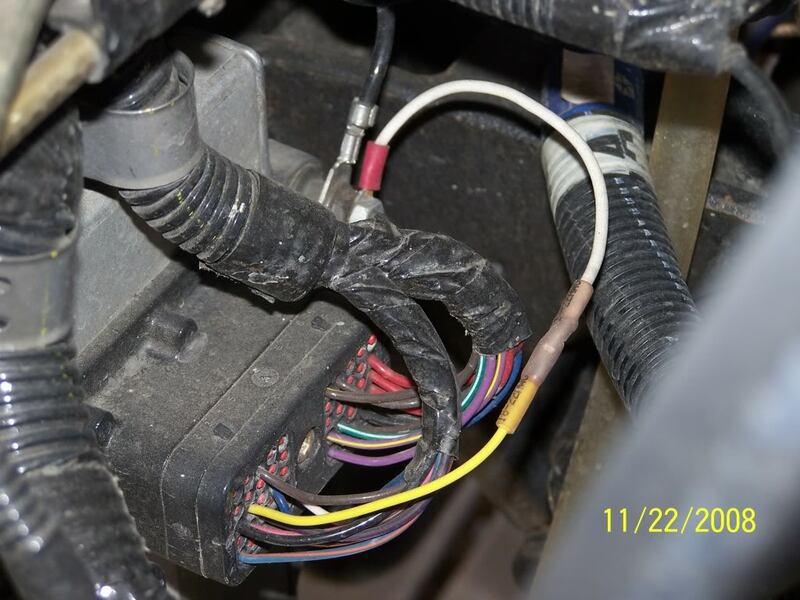 3) Remove plug B on the ECM (the 50 pin connector on the drivers side of the engine closest to the rear of engine with a 4mm Allen screw in the center). Note: this is probably best done with the both batteries disconnected first (I did mine with the batteries connected - sloppy). 3a) Push (use a paper clip) the sealing plug out of position #22 (starting at to left, count across, there are 50 pins total, #22 is second in from left, third row down) Note: #22 is the PTO/Clutch switch sense terminal (page 8W 80-98 in the shop manual). 3c) Reconnect the ECM connector, don't bother trying to push it on, just seat it square on the ECM connector, and carefully thread the 4mm Allen screw until it bottoms out. 3e) Add a 1/4-28 fine-grade nut to secure the ring-terminal to the ECM retaining stud, torque to... - oh hell - just tighten it !!! 3f) Reconnect the batteries if disconnected. 4) Take the truck to the dealer to enable the High Idle option. On older models, I think it's an actual TSB (18-004-04) to flash/load the ECM - my '06 just needed it to be enabled. - Ensure that the after the flash option has been loaded to the ECM (TSB 18-004-04) that it also activated - this is a additional step !! Again - note that on my newer '06 they just had to enable it - not flash it as a TSB !! - Stay off the clutch (if clutch switch was installed) and service brake pedals (recommend setting the parking brake on your 6 speed !!). - The engine should come up to 1,100 rpm. - Each time you hit accel momentarily it should go up 100 rpm (Max is 1,500 rpm). - Each time you hit decel momentarily it should go down 100 rpm (Min is 1,100 rpm). - Hit the service brake pedal, the RPM's should drop back down to the normal ~750. - Hit the "set" button, it should run back up to 1100 rpm. - Hit "cruise" to turn off cruise and the RPM's should drop back down to the normal ~750. 6) If you have any follow on TSB's that flash the ECM, remind the service manager (or better yet the tech) to ensure that high-idle is to be re-enabled following the TSB flash. Mine was disabled after applying the 18-003-06 hard-start TSB last week. 7) Smugly recall the fella who posted his stout-lumber stick "High Idle Management Interface" picture next time you're at a long light out in the flatlands and hit your "Cruise, Set" buttons... Don't roll into the intersection !! Thanks, I will do this when I get mine back. quick question. I have a 2004.5 and what does this do for the truck do i have this or is there a way to tell. Since you have an 04.5, my understanding is, it will work. Just follow the instructions. What it does is, it allows you to kick the rpms up when you leave the truck idling or at warm up. You turn the cruise on, hit set and it bumps the rpms up to 1100 automatically, if you hold down the accel button on the cruise, it will allow you to adjust the rpms up to 1500 rpm max. It helps to keep the cylinders from warshing down when the truck is idling. It's really great if you sleep in the truck or let it idle for long periods of time. I found out this morning, while sitting @ a stop light, it works great. It would also work great in traffic.